Every now and again a decision is made which turns the fortunes of a band. 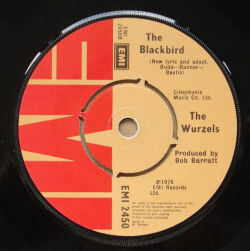 Band manager John Miles' decision for The Wurzels to record a "wurzeled-up" cover version of Brendan Grace's Irish #1 hit single The Combine Harvester, itself a parody of Melanie Safka's hit single Brand New Key was a master stroke. Grace's The Combine Harvester had been released in 1975, but while it topped the Irish singles charts, it failed to make an impression in the more lucrative UK singles charts. 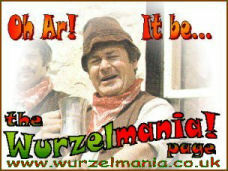 The Wurzels version of the song was released in the spring of 1976 but its success must have surprised everyone associated with the band. The song hit the charts in 15 May 1976, shot up to #14 the following week; a climb that earned them a slot of Top Of The Pops. On the back of that, it reached #3; a week later it was at #2, then on 12 June 1976 it reached the top of the UK Singles Charts (in an era where that meant something! ), and stayed there for two weeks. Proper stuff! 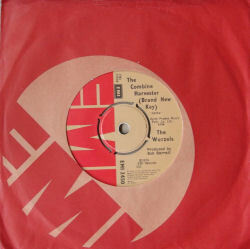 The single sold nearly 400,000 copies in the UK alone - and was UK's 16th top-selling single of the 1976. It was released across the world, and we are still tracking down how well it did overseas. It did chart in Canada - although was not a major hit. 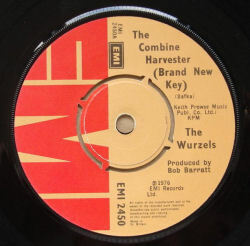 Combine Harvester was re-issued in 1980 on the HMV label. 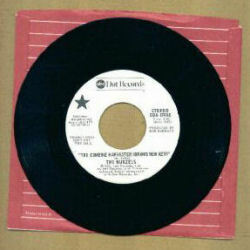 The American version of the single released on the ABC Dot Label. This is a promo copy.